Once part of an old dairy, the main house dates back to the late 1600s. 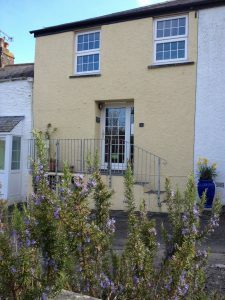 The corner of the building is now self-contained and has been recently transformed into an extremely cosy holiday home. 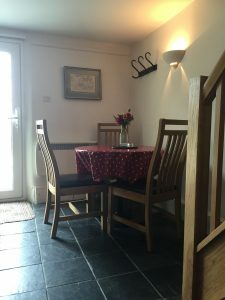 The owners use Frogmore Corner regularly and as such it feels very loved and lived in. The open fire draws well, the furniture is mostly modern but family antiques lend character as does the pretty wallpapered nook where teddies live. There is a definite sense of luxury in the modern twin bath and shower rooms that have under-floor heating. The kitchen too is all newly kitted out with dishwasher, cooker, microwave and fridge freezer. A washing machine and tumble dryer have been squeezed cleverly into an adjacent lobby. The new stair case which has replaced the original one that was falling down, leads to two bedrooms: one double, one single. Both have superb views over the valley of farmland below through which runs the River Fal. The old wooden and serious wonky floorboards upstairs are now snugly carpeted and the double glazed windows and roof insulation will keep you cosy and environmentally conscience clear. The front door opens onto the slate floor of the main and only living room. This entrance is approached up steps from the top of Mill Lane which is also the top of Frog Lane – a well worn path leading down to the bottom of Tregony Hill where the river flows under the old bridge. The pretty sheltered garden with a small lawn bordered by shrubs, is the perfect spot in which to sip a glass of wine after a day at the beach. Private off road parking is situated immediately opposite the cottage.